With a packed Wednesday schedule, riders had only moments after the TT Zero celebration to mount their Supersport machines for the second race of the Monster Energy Supersport TT, and with mist reported on the mountain, a quick send-off was also necessary in order to ensure a full race distance ensued. The only man not in a rush though was John McGuinness, as the now 21-time TT race winner had announced in the morning that he and the Padgetts Hona team had decided it best not to race in the second Supersport race of the 2014 Isle of Man TT, as McPint has been suffering from a wrist injury, which was noticeably holding him back this TT fortnight. In fine form all week though has been the Kiwi Bruce Anstey, and he and Michael Dunlop seemed set for another showdown on the Snaefell Mountain Course. Once again, the weather played its part in my plans today. With a delayed Supersport race start due to low clouds and overnight rain, I decided against my plan of locations and revisited the Creg-ny-Baa and Kate’s cottage. This was mainly because of the dark clouds that made me unsure if a full race would be completed today, never mind both of the two scheduled races. With the dramatic backdrop of Onchan and Douglas bay, riders approach Kate’s after the quick Keppel Gate turn, on the descent from the Mountain summit. 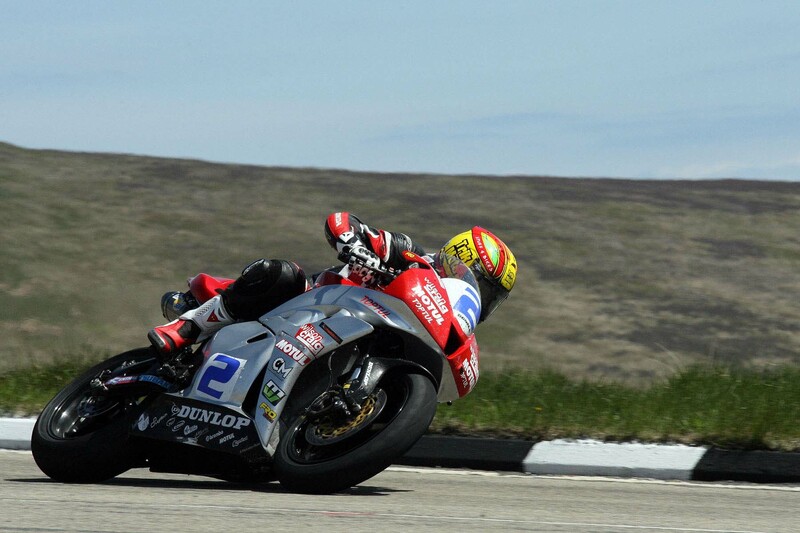 A fast left-hand turn at the cottage sends the riders on the long drag towards the Creg. The walk to Kate’s from the Creg is a mix of gorse bushes (shorts were a bad choice today) and spongy, sodden marshland. The marsh almost claimed one of my walking boots when I found myself up to my knee in moss, mud, and slime on the walk back down, but thankfully, my gear remained dry. Monday brings us the first of the two Monster Energy Supersport TT races at the 2014 Isle of Man TT — though just barely, as isolated showers first delayed the start and nearly cut its ending short. Thankfully though, all four laps of the Supersport TT race were held, and great racing ensued for the fans who braved the weather. Stop what you’re doing for the next 18 minutes — just stop right now. Take a ride with Michael Dunlop on his Honda CBR600RR during the Isle of Man TT’s second Supersport race. We enter the race on lap three of four, Michael Dunlop has just finished his pit stop, and is in second place on corrected time — Bruce Anstey is leading. 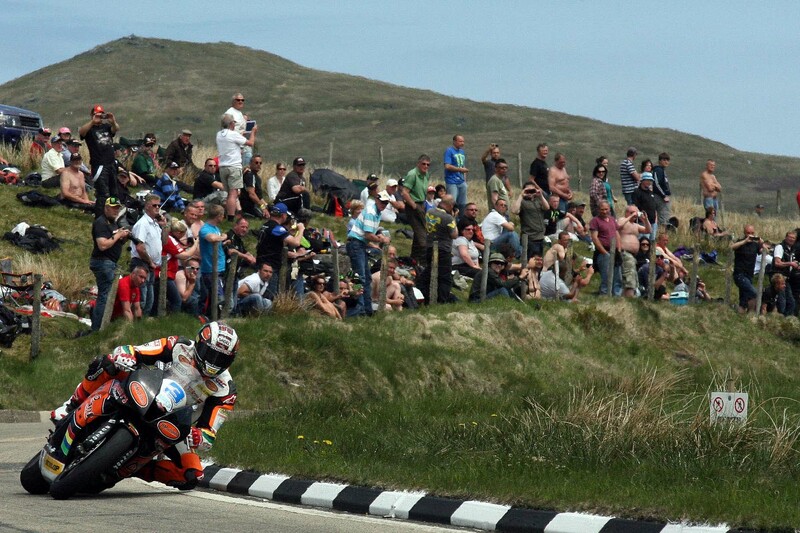 On the course, Michael is behind John McGuinness and Cameron Donald, who serve as his carrot. At this point in the TT fortnight, Dunlop has already won three races and the nephew of Joey is looking for win number four as he puts the hammer down coming down Bray Hill. This is more than a video of an epic lap around Snaefell Mountain Course, it’s a lap of Michael Dunlop’s determination. There should be no doubt about Michael being a force to be reckond with in 2014. After an announcement in early January that Milwaukee Power Tools had withdrawn its support of Shaun Muir’s Yamaha team, due to a major rule changes that restricted the use of aftermarket ECUs, it looked as though Ian Hutchinson and Josh Brookes might have had to sit out this year’s Isle of Man TT; and had the team been forced to run factory ECUs, it would have placed them at a serious disadvantage and left them unable to be competitive. Although there is no word on exactly how the team managed to negotiate an exception to the new rule change, the Isle of Man TT Press Office has confirmed that Ian Hutchinson and Josh Brookes will be riding for the Milwaukee Yamaha Team in this year’s TT. Both riders are scheduled to compete in the Dainese Superbike TT, two Monster Energy Supersport TT races, and the Pokerstars Senior TT event. As part of the triumphant return of Keith Amor to road racing, the Scotsman has announced that he will be competing in both of the Monster Energy Supersport races in the 2014 Isle of Man TT. Amor has already announced that he will be returning as a member of Ryan Farquhar’s KMR Kawasaki team for the Lightweight TT, but he will also be riding the Site Sealants B&W Racing Honda CBR600RR. A fan favorite, Amor has carved out a name for himself by racking up several impressive victories and setting lap records along the way. I’m going to put my fingers in my ears and go “lalalala” on this one, since someone has ripped ITV4’s coverage off the telly and put it onto the intertubes. With television networks not getting Friedman’s memo about the world being flat, those of us with an IP address outside of the United Kingdom are SOL when it comes to watching the FREE COVERAGE of the 2012 Isle of Man TT episodes on ITV4’s website. Thankfully, a more enlightened individual has put the coverage up on YouTube for those outside of the Queen’s domain to view. Enjoy it while it lasts.